The POOR GIRL team consisted of: Dave Eason, Tim O’Donnell, Bob O’Donnell, Sean O’Donnell, Owner/Captain Jack O’Donnell, Phil Quam, Bill Webb, Jack Webb III Mate, Kevin Laxton, and Mate, Christian Del Campo Trejo. Owner/captain Jack O’Donnell, fishing with his team aboard POOR GIRL, a 65-foot Paul Mann, won third place honors for releasing 10 white marlin (six on the 24th and four on the 25th worth 700 points altogether) in the recent and highly competitive Virginia Beach Tournament. 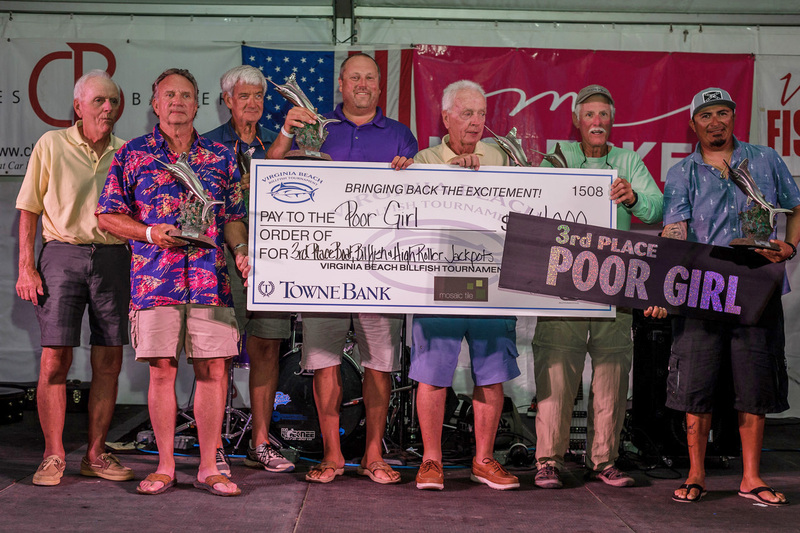 The POOR GIRL team pocketed $64,000 for placing in the Billfish and High Rollers Jackpot categories. Sean O’Donnell was also named the Top Release Angler for catching five billfish. A record 80 boats with 571 anglers competed this year for a new benchmark $620,000 in prize money. Well over 300 billfish were released including blue marlin, many white marlin, sailfish and spearfish. Paul Mann Custom Boats sends a shout out and congratulations to all the owners and anglers aboard POOR GIRL for an incredible winning and teamwork during this great Virginia Beach competition! The Paul Mann fleet had a huge showing and congratulates all of the anglers aboard the Paul Mann boats including the A-Salt Weapon, Ann Warrick, Poor Girl, Qualifier, Sniper and Wildlife.